Ranked on Rolling Stone Magazine’s lists of 100 Greatest Guitarists (#40) and 100 Greatest Singers (#72), and with the number 41 and 53 spots on the publication’s list of Greatest Pop Songs, John Fogerty has entertained crowds for decades as a member of the Creedence Clearwater Revival and as a solo artist. 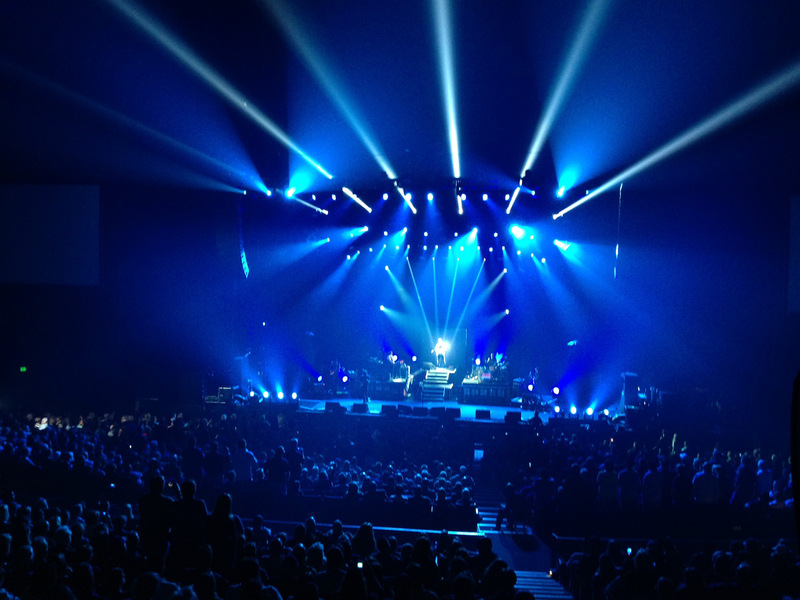 Recently the classic rock legend wrapped up an 8-week US tour which featured a stunning light show staring Martin Professional fixtures, designed to entertain fans with a completely new visual experience along with Fogerty’s classic rock sound. Production Designer Alex Skowron designed and built the lighting rig to include 21 Martin Atomic Colors, 17 MAC 2000 washes, 14 MAC Viper profiles, 14 Viper washes, 10 MAC 2000 profiles, eight MAC III’s and eight MAC 401 RGB fixtures. Two Martin M1 lighting consoles ran lighting and video content during the show, which projected onto 12x21 high-resolution screens and seven other surfaces surrounding the stage. Upstaging supplied all of the Martin fixtures for the tour. Skowron developed a show that would redefine the classic rock soloist genre of touring musicians. This wasn’t just your average musician-on-a-chair-type show. With Martin, fans were welcomed with a full concert experience, with an up-to-date vibe on the songs they’ve known and loved for decades. Multiple color schemes and background video highlighted Fogerty’s music during each set. Skowron plans to take his Martin rig on a European tour with Fogerty in mid 2014.